Perhaps nothing is more troubling than Dulles’s behavior around the time that John F. Kennedy was assassinated. Although Kennedy had fired him in 1961, Dulles basically kept, de facto, running the CIA anyway, as Talbot notes. And, even more ominously, after Kennedy was killed in Dallas on Friday November 22, Dulles moved into The Farm, a secret CIA facility in Virginia, where he remained for the weekend — during which time the “suspect,” Lee Harvey Oswald, was killed, and a vast machinery began to create the “lone gunman” myth that has dominated our history books to the present. And that same machinery began to bury evidence that Oswald himself had deep connections into US intelligence. Throughout all this, it is clear, Dulles was no rogue operative. He was serving the interests of America’s corporate and war-making elites. And he went all out. The “former” CIA director was so determined to control the JFK death story spin, as Talbot chronicles below, that he even tried to strong-arm former president Harry Truman when the plain-spoken Missourian broadly hinted that he suspected the Agency was involved in Kennedy’s murder. First part of a compressed Excerpt of Chapter 20, “For the Good of the Country” from The Devil’s Chessboard. 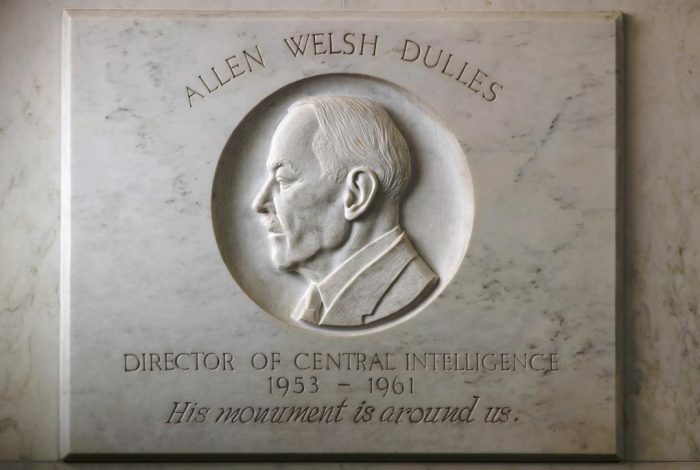 Allen Dulles, the CIA, and the Rise of the American Secret Government. HarperCollins Publishers, 2015. Over the final months of JFK’s presidency, a clear consensus took shape within America’s deep state: Kennedy was a national security threat. For the good of the country, he must be removed. And Dulles was the only man with the stature, connections, and decisive will to make something of this enormity happen. He had already assembled a killing machine to operate overseas. Now he prepared to bring it home to Dallas. All that his establishment colleagues had to do was to look the other way — as they always did when Dulles took executive action. In the case of Doug Dillon — who oversaw Kennedy’s Secret Service apparatus — it simply meant making sure that he was out of town … If he was later asked to account for himself, Dillon would have a ready explanation. The tragic events in Dallas had not occurred on his watch; he was airborne over the Pacific at the time. There is no evidence that reigning corporate figures like David Rockefeller were part of the plot against President Kennedy or had foreknowledge of the crime. But there is ample evidence of the overwhelming hostility to Kennedy in these corporate circles — a surging antagonism that certainly emboldened Dulles and other national security enemies of the president. And if the assassination of President Kennedy was indeed an “establishment crime,” as University of Pittsburgh sociology professor Donald Gibson has suggested, there is even more reason to see the official investigation as an establishment cover-up. Oswald was still alive, and that was a problem. He was supposed to be killed as he left the Texas School Book Depository. That’s what G. Robert Blakey, the former Kennedy Justice Department attorney who served as chief counsel for the House Select Committee on Assassinations, later concluded about the man authorities rushed to designate the lone assassin. But Oswald escaped, and after being taken alive by Dallas police in a movie theater, he became a major conundrum for those trying to pin the crime on him. Oswald further signaled that he was part of an intelligence operation by trying to make an intriguing phone call shortly before midnight East Coast time on Saturday, November 23. The police switchboard operator, who was being closely monitored by two unidentified officials, told Oswald there was no answer, though she actually did not put through the call. It was not until years later that independent researchers traced the phone number that Oswald tried to call to a former US Army intelligence officer in Raleigh, North Carolina. The Raleigh call probably sealed Oswald’s fate, according to Marchetti. By refusing to play the role of the “patsy” and instead following his intelligence protocol, Oswald made clear that he was trouble. Oswald was not just alive on the afternoon of November 22, 1963; he was likely innocent. This was another major problem for the organizers of the assassination. Even close legal observers of the case who continue to believe in Oswald’s guilt — such as Bob Blakey who, after serving on the House Assassinations Committee, became a law professor at Notre Dame University—acknowledge that a “credible” case could have been made for Oswald’s innocence based on the evidence. (The 1979 congressional report found that Kennedy was the victim of a conspiracy involving Oswald and other unknown parties.) Other legal experts, like San Francisco attorney and Kennedy researcher Bill Simpich, have gone further, arguing that the case against Oswald was riddled with such glaring inconsistencies that it would have quickly unraveled in court. Fortunately for the conspirators, the deeply flawed case against Lee Harvey Oswald never made it to court….Oswald’s shocking murder — broadcast live into America’s homes — solved one dilemma for Dulles, as he monitored the Dallas events that weekend from the Farm, his secure CIA facility in Virginia. But it soon became apparent that Oswald’s murder created another problem — a wave of public suspicion that swept over the nation and beyond…. To many people who watched the horrifying spectacle on TV, the shooting smacked of a gangland hit aimed at silencing Oswald before he could talk. In fact, this is precisely what Attorney General Robert Kennedy concluded after his investigators began digging into Ruby’s background. Bobby, who had made his political reputation as a Senate investigator of organized crime, pored over Ruby’s phone records from the days leading up to the Dallas violence. later remarked. The attorney general’s suspicions about the death of his brother immediately fell not just on the Mafia, but on the CIA — the agency that, as Bobby knew, had been using the mob to do some of its dirtiest work…. Meanwhile, down in Independence, Missouri, another retired president, Harry Truman, was fuming about the CIA. On December 22, 1963, while the country was still reeling from the gunfire in Dallas, Truman published a highly provocative op-ed article in The Washington Post, charging that the CIA had grown alarmingly out of control since he established it. The timing of Truman’s opinion piece was striking. Appearing in the capital’s leading newspaper exactly one month after the assassination, the article caused shock waves in political circles. There was a disturbing undertone to the straight-talking midwesterner’s warning about the CIA. Was Truman implying that there was “sinister and mysterious intrigue” behind Kennedy’s death? Could that have been what he meant when he suggested that the agency represented a growing danger to our own democracy? Allen Dulles knew the danger of words, the wrong kind of words. As CIA director, he had spent an untold fortune each year on countering the Soviet propaganda machine and controlling the world’s conversation, including the political and media dialogue in his own country. Within minutes of the Kennedy assassination, the CIA tried to steer news reporting and commentary about Dallas, planting stories that suggested — falsely — that Oswald was a Soviet agent or that Castro was behind JFK’s murder. Still, Dulles would not accept defeat. Unable to alter reality, he simply altered the record, like any good spy. But despite the CIA’s strenuous efforts, press coverage of the Kennedy assassination began spinning out of its control. Dulles knew that immediate steps must be taken to contain the conversation…. If Harry Truman — the man who created the CIA — was worried that it had become a Frankenstein, it might be only a matter of time before prominent European figures, and even some stray voices in America, began to question whether the agency was behind JFK’s murder. It was Dulles himself who jumped in to put out the Truman fire. Soon after the Post published Truman’s diatribe, Dulles began a campaign to get the retired president to disavow his opinion piece. The spymaster began by enlisting the help of Washington power attorney Clark Clifford, the former Truman counselor who chaired President Johnson’s intelligence advisory board. The CIA “was really HST’s baby or at least his adopted child,” Dulles pointed out in a letter to Clifford. Perhaps the attorney could talk some sense into the tough old bird and get him to retract his harsh criticisms of the agency. To an extent, Dulles had a point. As the spymaster pointed out, the Truman Doctrine had indeed authorized an aggressive strategy aimed at thwarting Communist advances in Western Europe, including CIA intervention in the 1948 Italian elections. But Truman was correct in charging that, under Eisenhower, Dulles had led the CIA much deeper into skulduggery than he ever envisioned. Unmoved by Dulles’s letter, Truman stood by his article. Realizing the threat that Truman posed, Dulles continued his crusade to discredit the Post essay well into the following year. Confident of his powers of persuasion, the spymaster made a personal trek to Independence, Missouri, in April, arranging to meet face-to-face with Truman at his presidential library. After exchanging a few minutes of small talk about the old days, Dulles mounted his assault on Truman, employing his usual mix of sweet talk and arm-twisting. But Truman — even on the brink of turning eighty — was no pushover, and Dulles’s efforts proved fruitless. The Dulles letter to Houston — which was clearly intended for the CIA files, to be retrieved whenever expedient — was an outrageous piece of disinformation. Truman, who would live for eight more years, was still of sound mind in April 1964. And he could not have been shocked by the contents of his own article, since he had been expressing the same views about the CIA — even more strongly — to friends and journalists for some time. After the Bay of Pigs, Truman had confided in writer Merle Miller that he regretted ever establishing the CIA. “I think it was a mistake,” he said. “And if I’d known what was going to happen, I never would have done it…. [Eisenhower] never paid any attention to it, and it got out of hand…. It’s become a government all of its own and all secret…. That’s a very dangerous thing in a democratic society.” Likewise, after the Washington Post essay ran, Truman’s original CIA director, Admiral Sidney Souers — who shared his former boss’s limited concept of the agency — congratulated him for writing the piece. “I am happy as I can be that my article on the Central Intelligence Agency rang a bell with you because you know why the organization was set up,” Truman wrote back to Souers. Dulles’s relentless effort to manipulate Truman — and failing that, the Truman record — is yet one more example of the spymaster’s “strange activities.” But Dulles’s greatest success at reconstructing reality was still to come. With the Warren Report, Dulles would literally rewrite history. The inquest into the death of John F. Kennedy was another astounding sleight of hand on Dulles’s part. The man who should have been in the witness chair wound up instead in control of the inquiry. NEXT: Part 2. For part 3, go here.